This recipe was created as yet another way to use baked ham, but one could substitute 1/2 pound cooked and drained breakfast sausage or 6 slices cooked and crumbled bacon. 1. Preheat oven to 425°. Generously grease a 12 cup muffin tin with non-stick spray or butter. 2. In a large bowl, combine the hash browns, melted butter, 1/2 tsp salt and 14 tsp pepper, mixing well. Scoop 1/3 cup into each muffin cup and press into the bottom and up the sides to form a crust. Bake for about 20 minutes to lightly brown. 3. Meanwhile, in a small skillet, heat 1 tsp. butter over medium high heat until it begins to brown. Watch carefully, as the butter can burn quickly. Add the bell pepper and green onion; lower heat to medium low and cook until just beginning to soften. Season with a pinch of salt and pepper. Remove from heat. 4. In a medium bowl or 2 cup glass measuring cup, whisk together the eggs, half-and-half, 1/2 tsp salt and 1/4 tsp pepper. 5. 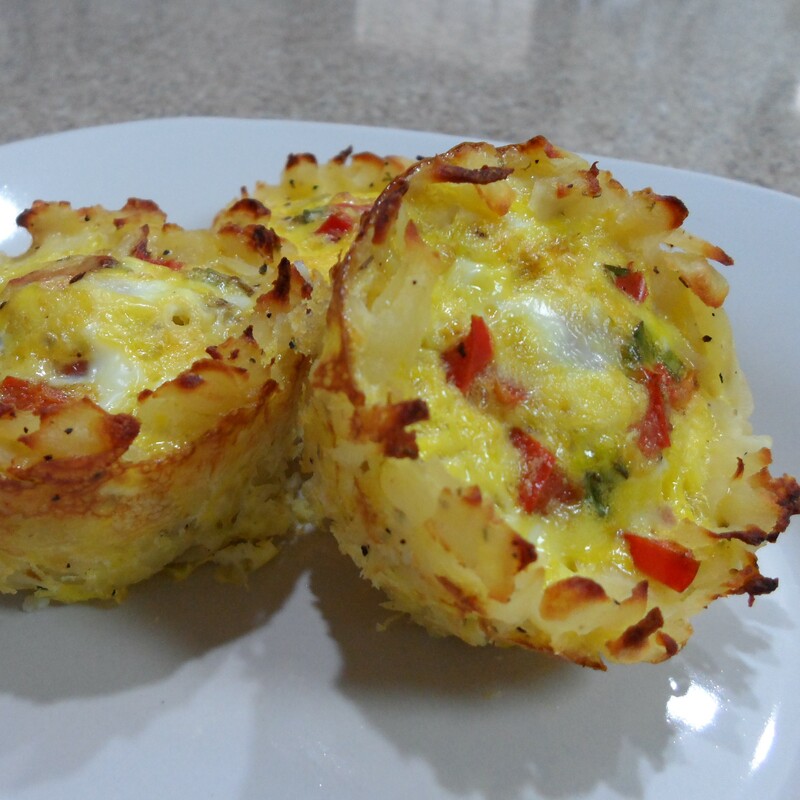 When the hash brown cups have lightly browned, remove from oven and again press firmly into their cups. Layer in the ham and veggies, dividing evenly. Pour on the egg mixture and return to oven. 6. Bake another 15 minutes, or until the eggs are set. Run a small knife around the edge of each cup. Let stand 5 to 10 minutes before removing from pan.